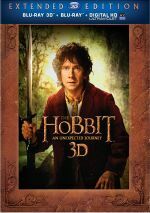 Bilbo Baggins gets swept into an epic quest to reclaim the lost Dwarf Kingdom of Erebor from the fearsome dragon Smaug. As Yogi Berra once said, it’s déjà vu all over again. About a decade ago, we saw the three Lord of the Rings movies go through a similar release pattern: they’d hit movie screens in December and standard DVD versions would appear in midway the following year with deluxe “Extended Editions” a few months later. That held true for all three of the Rings flicks and it continued for Peter Jackson’s newest Tolkien trilogy, The Hobbit. The theatrical cut for 2012’s An Unexpected Journey appeared in March 2013 and in November 2013, we got the inevitable “Extended Edition”. Though perhaps not as “inevitable” as was the case for the Rings films. Even though those three ran more than nine hours total, Jackson still needed to drop a lot of material from JRR Tolkien’s source novel. After all, the book filled well over 1000 pages, so even three long movies couldn’t cover everything. On the other hand, The Hobbit provided a much more concise novel. It clocks in around 300 pages, so its events could’ve been covered in one movie without much trouble. Instead, Jackson chose to turn Hobbit into two movies – and then decided that three would work even better! To do so, the Hobbit trilogy would take from Tolkien works beyond the one novel and would become an epic much closer to Rings. Because the 168-minute Unexpected Journey already seemed long – and padded to some – the availability of an extended version felt less inevitable. If Jackson already stretched the movie well beyond the parameters of the source, why deliver an even longer version? You’ll have to ask Jackson that – I’m just here to review the result. For full coverage of my thoughts about Journey, please check out my review of the theatrical version. For this article, I’ll stick mostly with the differences evident in the “Extended Edition” of the film. Thanks to a helpful option in the chapter menu, I can easily identify scenes that are new and those that are extended. In the former category, we get “Mr. Baggins” (1:17) and “The Last Homely House” (2:37). During “Mr. Baggins”, we see Bilbo out and about among the other Hobbits, while “House” shows Bilbo as he wanders Rivendell and encounters artifacts that will become meaningful later. He also chats with Elrond and displays how “at home” he feels in Rivendell. Finally, we see Dwarves bathe in an Elf fountain. Of the two, “House” offers easily the more interesting sequence. I like the foreshadowing it includes, and the short bathing bit delivers mild humor. It’s not a crucial segment, but it’s enjoyable and would’ve worked in the final cut. “Baggins” seems more superfluous. It’s nice to see more of Hobbit life but it does little to move along the story, so the film works fine without it. In terms of extended scenes, we find six: “Prologue: The Fall of Erebor” (10:11), “’Blunt the Knives’” (4:43), “Rivendell” (5:38), “A Short Rest” (3:36), “The White Council” (8:42) and “The Great Goblin” (5:54). Note that those running times cover the entirety of the scenes, not just the added bits. Given that the longer Journey adds about 14 minutes to the theatrical cut, we get roughly eight minutes of new footage in the Extended Edition. Here are how the alterations shake out. The time listings offer the locations of the added pieces in the Extended Cut. Prologue (4:10-4:57): we learn more about the rift between the Dwarves and the Elves. Prologue (9:39-10:12): young Bilbo meets Gandalf. Blunt (23:20-23:42): Bilbo meets Bifur and Oin. Rivendell (1:25:15-1:25:39): Bilbo senses magic and discusses it with Gandalf. A Short Rest (1:31:00-1:31:39): Kili discusses the attractiveness of Elfmaids. A Short Rest (1:32:44-1:34:11): Gandalf discusses his Dwarf compatriots with Elrond and then Bofur leads them in a song. The White Council (1:42:07-1:43:14): Bilbo and Thorin overhear Gandalf and Elrond as they discuss the Dwarves’ quest; Elrond hints at madness in Thorin’s family. The White Council (1:45:10-1:45:58): Gandalf worries about the fate of a missing Dwarf ring while Saruman tells him it’s useless without the also-lost “One Ring”. The Great Goblin (2:04:13-2:06:25): We meet the Great Goblin and he sings a song. The Great Goblin: (2:06:57-2:07:15): The Goblins look over trinkets Nori stole from Rivendell. The Great Goblin (2:07:20-2:08:14): Oin and Bofur derail the Great Goblin’s quest for information. Note that a few of these scenes came with other minor changes due to editing. For instance, the shots with young Bilbo altered what followed in a mild manner, as they wouldn’t work without a little rejiggering. The quality of the extended scenes varies from “cute but inconsequential” to “pretty useful”. The best scenes add to the plot, such as the “White Council” bits; those are easily the most valuable new snippets. I also like the revelations about the Dwarf/Elf rift as well as the glimpse of young Bilbo and the shots with Baggins in Rivenbell. As for the rest? Ehhh. As a fan, I think it’s fun to see these scenes, but none of them add to the experience. The Great Goblin song becomes the weakest of the bunch, so it’s the only one I’d really prefer to be omitted from the movie. The others are fine but I can take or leave them. I don’t mind seeing these added tidbits, but I don’t think they make the movie better. That said, the Extended Edition contributes just enough intriguing material to make it my preferred cut. Nothing here creates substantial changes, which will disappoint viewers who expect the same impact found in the Extended LOTR films. However, I like the extra scenes and don’t think any of them harm the movie in any way; the worst – ie, the Goblin song – does no damage to the film beyond being a little boring. While I don’t think the Extended Edition substantially beats the theatrical cut, it does become the version I’ll watch in the future. The Hobbit: An Unexpected Journey appears in an aspect ratio of approximately 2.40:1 on this Blu-Ray Disc. From start to finish, the film delivered a spectacular visual experience. At all times, sharpness appeared crisp and distinctive. Even when the movie went with wide shots – which happened a lot – the elements remained accurate. I saw no issues with moiré effects or jaggies, and the image lacked edge haloes or signs of artifacts. No print flaws appeared in this clean presentation. If you saw the Lord of the Rings films, you’ll encounter a similar palette here. Greens and ambers dominated the Hobbiton sequences, while other parts of the flick opted for teal, blue and orange. Within the movie’s choices, the hues looked full and well-developed. Blacks were deep and dense, and shadows showed nice clarity and smoothness. This was an absolutely top-notch image. Similar pleasures came with the DTS-HD MA 7.1 soundtrack of Unexpected Journey. Of course, the movie’s many action sequences offered the most memorable material. The early battle between Smaug and the dwarves dazzled, with fire and flying all around the room, and subsequent fight sequences worked equally well. The soundscape placed components in the appropriate locations and meshed them together in a smooth, well-blended manner. Audio quality was also terrific. Music seemed vivid and bold, while speech was distinctive and concise. Effects showed solid clarity and accuracy, with low-end response that gave the package life and heft. This was an impressive auditory piece. This package includes both the film’s 2D and 3D versions. The picture comments reflect the 2D edition – how does the 3D compare? Pretty favorably, though it doesn’t look quite as amazing. Sharpness and brightness take minor hits, so the 3D’s image falls a wee bit short of the 2D’s quality. These are minimal differences, though, so one should still expect a very appealing picture. Shot on native cameras, Journey provides a handful of “pop-out” moments, as elements such as weapons, birds, insects and the like occasionally break free from the screen’s confines. The majority of the film concentrates on depth, though – and it does so in a most satisfying manner. Journey delivers a terrific impression of dimensionality that places the viewer in the surroundings. Rain engulfs the characters, and scenes where height becomes a factor – such as in Goblin Town or on bridges – offer a dizzying impression. Journey may not boast the most fun 3D presentation I’ve seen, but it uses the extra layer of visual punch to impressive effect. Alongside the 2D version of the film, we find an audio commentary from director/writer/producer Peter Jackson and writer/co-producer Philippa Boyens. Both sit together for a running, screen-specific look at the source material and its adaptation, cast and performances, story, character and script areas, changes for the Extended Edition, sets and locations, cinematography and visual design, various effects, music and other domains. Since all three of the Lord of the Rings Extended Editions included four commentaries apiece, it’s a disappointment that Hobbit only opts for one. That said, Jackson and Boyens cover the film in a more than satisfactory manner. They dig into a nice variety of topics and do so in a thorough – and charming – manner. The commentary cranks along at a nice pace and becomes a likable, informative overview. The only extra repeated from the original Blu-ray, New Zealand: Home of Middle-earth runs six minutes, 35 seconds and provides notes from Boyens, Jackson, production designer Dan Hennah, Hobbiton movie set and farm tour owner/operator Russell Alexander, conceptual designers Alan Lee and John Howe, actor/2nd unit director Andy Serkis, 2nd unit 1st AD Liz Tan, and actors Richard Armitage, Mark Hadlow, Ian McKellen, Martin Freeman, Elijah Wood, Jed Brophy, Graham McTavish, William Kircher, Sylvester McCoy, Dean O’Gorman, Peter Hambleton, James Nesbitt and Stephen Hunter. The program gives us some info about the sets and locations used for the film. At times this feels like an ad for tourism, but it delivers enough good material to merit a look. On Disc Four, we open with an Introduction by Peter Jackson. In this one-minute, 54-second piece, the director talks about what we can expect from the bonus materials on Discs Four and Five. It’s unnecessary but painless. The meat of Disc Four comes from a compendium of featurettes called A Long-Expected Journey: The Chronicles of The Hobbit - Part 1. We find 16 chapters here, and they range in length from two minutes, 42 seconds (“Opening”) to 48 minutes, 19 seconds (“The Journey Back to Middle-Earth”). All together, “Chronicles” fills a whopping four hours, 31 minutes, 11 seconds. We hear from Jackson, Boyens, actor/2nd unit director Andy Serkis, Weta Workshop concept artist Daniel Falconer, conceptual designers John Howe and Alan Lee, NZ casting directors Miranda Rivers and Liz Mullane, unit production manager Brigitte Yorke, Weta Workshop creative director Richard Taylor, Weta Workshop supervisor Rob Gillies, production designer Dan Hennah, armour and weapons production manager Jamie Wilson, prop making supervisor Paul Gray, Weta Workshop concept artist Paul Tobin, costumer Beverly Francis, motion control supervisor Alex Funke, 2nd unit DP Richard Black, stunt coordinator Glenn Boswell, assistant stunt coordinator Tim Wong, scale double acting coaches Nick Blake and Nathan Meister, movement coordinator Terry Notary, composer Janet Roddick, composer/music editor Stephen Gallagher, dialect coach Leith McPherson, set decorator Ra Vincent, motion capture production manager Lisa Wildermoth, animation supervisor David Clayton, digital effects supervisor Jeff Capogreco, textures supervisor Gino Acevedo, senior visual effects supervisor Joe Letteri, sound mixer Tony Johnson, gaffer Reg Garside, on set art director Ben Milsom, key grip Tony Keddy, greens master Simon Lowe, visual effects supervisor Eric Saindon, SPFX supervisor Steve Ingram, VFX producer Kevin L. Sherwood, animation supervisor Eric Reynolds, prosthetic supervisor Tami Lane, supervising dialect coach Roisin Carty, 2nd 2nd AD Bruno Du Bois, board operator Reuben Morrison, stunt performer Brett Sheerin, Weta Workshop technician James French, senior SPFX Scott Harens, site supervisor Mike Turner, editor Jabez Olssen, VFX supervisor Matt Aitken, post production supervisor Joshua Levinson, script supervisor Victoria Sullivan, and actors Cate Blanchett, Martin Freeman, Elijah Wood, Hugo Weaving, Ian McKellen, Richard Armitage, Mark Hadlow, Graham McTavish, Adam Brown, John Callen, Peter Hambleton, Stephen Hunter, Aidan Turner, Kiran Shah, James Nesbitt, William Kircher, Jed Brophy, Ken Stott, Dean O’Gorman, Sylvester McCoy, Bret McKenzie, Christopher Lee, Luke Evans, John Ball, Benedict Cumberbatch and Barry Humphries. “Chronicles” covers the novel’s complicated path to the screen, concept design, actor training and rehearsals, the start of principal photography and aspects of the shoot, performances and related technical issues, sets and production design, various effects, stunts and action, costumes, weapons and makeup, the end of principal photography and the movie’s premiere. With four and a half hours of material, you might fear that “Chronicles” would become slow or tedious. Worry not, as it remains consistently involving and informative across its extended running time. “Chronicles” delivers a good mix of the technical and creative along with ample amounts of footage from the set. This becomes an excellent examination of the production. On Disc Five, we find another compilation of featurettes. Entitled Return to Middle-Earth, these last between three minutes, 23 seconds (“Credits”) and one hour, two minutes, 41 seconds (“The Company of Thorin”). Taken as a whole, they go for four hours, 45 minutes, 19 seconds. Among those heard from earlier, we get notes from Jackson, Boyens, Brophy, Rivers, Mullane, Hunter, Nesbitt, Callen, Kircher, McTavish, Brown, Taylor, Hadlow, Armitage, O’Gorman, Turner, Hambleton, Du Bois, Stott, Freeman, McKellen, Howe, Falconer, Gillies, Tobin, Alan Lee, Lane, Acevedo, Clayton, Letteri, Capagreco, Wildermoth, Notary, Christopher Lee, McPherson, Serkis, McCoy, Sherwood, Humphries, Saindon, Vincent, Wood, Hennah, Yorke, Blanchett, Milsom, Gray, Gallagher, and Roddick. In terms of new participants, we find material from stunt performer Isaac Hamon, Weta Workshop lead concept designer Nick Keller, Weta Workshop sculptors Kim Beaton and Jamie Beswarick, Weta Workshop concept artists Frank Victoria, Lindsey Crummett, Greg Tozer and Johnny Fraser-Allen, hair and makeup designer Peter Swords King, costume designers Ann Maskrey and Bob Buck, costumer Amy Craven, textile artist Kelly Olatunji, Weta Workshop technician Kim Docherty, special makeup and prosthetics supervisor Jason Docherty, prosthetic makeup artist Georgia Allen, master swordsmith Peter Lyon, additional costumer Emma Evans, lead creatures designer Andrew Baker, digital creature supervisor Simon Clutterbuck, textures technical supervisor Glen Sharah, senior shader TD Christopher George, VFX supervisor Chris White, texture artist Daniel Bennett, actor Manu Bennett, Hobbiton Movie Set and Farm Tour owner Russell Alexander, supervising art director Simon Bright, art director Brian Massey, set dresser Ben Whale, Middle-Earth Minstrel editor/author Bradford Lee Eden, sound designer Dave Whitehead, composer David Long, and musician Neil Finn. The first half of “Return” digs into adaptation challenges and developing/designing the dwarf characters, casting the dwarves/Bilbo and performances. From there, we look at how the film brought to life other characters like the trolls, Radagast, goblins, Azog and the Stone Giants as well as locations and set design, and music and audio. “Return” acts as a nice complement to “Chronicles”. While the first compilation gives us a fairly chronological traipse through the production, "Return” spends much more time on specific character and set issues; indeed, the discussion of the dwarves fills an awful lot of its running time. Might this prove to be overkill? Perhaps for some viewers, but like “Chronicles”, I think “Return” remains so lively and informative that it rarely slows or hits lulls. It digs into its topics in an involving way that never becomes tiresome or too technical. That allows it to move quickly and feel much shorter than one would expect given its extended length. While not as good as any of the Lord of the Rings films, The Hobbit: An Unexpected Journey launches a new franchise in an enjoyable manner. The movie’s “Extended Edition” delivers a mild variation on the theatrical cut that’s fun to see but doesn’t substantially alter/improve the original. 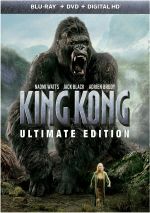 The Blu-ray provides excellent picture and audio along with an extremely satisfying roster of bonus materials, and the 3D version brings zing to the proceedings. This turns into the best way to watch the film.